Patched-up Panthers’ hopes of finishing top of the SGB Championship were hit by defeat last night (September 14). The city side were beaten 52-38 at Workington in their penultimate fixture of the regular season – a result which left them vulnerable at the summit but clinched their conquerors’ play-off spot. Guests Ben Barker and Jordan Stewart were responsible for Panthers’ four race victories at soggy Derwent Park despite both crashing out of their final rides. Stand-in number one Barker scored 10+2 before tumbling out of second spot in the finale while his Redcar team-mate Stewart, again replacing Tom Bacon at reserve, racked up seven points before going down in heat 13. The Australian suffered a leg injury which prevented him taking his place in a re-run in which fellow reserve guest Coty Garcia, who came in for skipper Simon Lambert, followed home Barker for a 5-1. That followed up a Stewart-inspired 4-2 in the previous race, but Panthers couldn’t go on to claim a league point. They were condemned to defeat by a 5-1 from Comets pair Rene Bach and Mason Campton in heat 14 before Bach also triumphed as the hosts took a 4-2 in the finale. 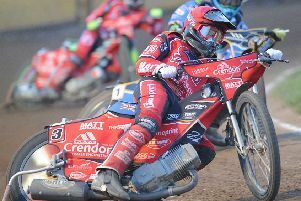 Danish rider Bach, who started his British career with Panthers many years ago, piled up 17 points while countryman Rasmus Jensen produced a four-ride full-house of 12 for Workington. “The conditions were far from ideal,” said Panthers team boss Carl Johnson. “In fact I’ve seen many meetings called off when tracks are in better shape than the one we rode on last night. “It looked really good until it hammered down with rain for 10 to 15 minutes. The track did drain well in all fairness, but it was never going to produce good racing. “It put a big emphasis on gating and Workington did that far better than we did and that’s the story of the meeting to be honest. “They wanted it more than us as they still needed to seal their play-off place whereas we were already confirmed. “Our form has dropped recently and that’s a concern. We’ve worked so hard to get here that we can’t just let the season fizzle out despite the big losses of Scott (Nicholls) and Tom to injury. Bradley Wilson-Dean contributed seven points for Panthers at Workington and his middle-order partner Michael Palm Toft struggled by his own high 2018 standards with 5+2. Second string Emil Grondal bagged two second places but also brought up the rear in his other two outings, while Ulrich Ostergaard failed to score in his second meeting since returning from a two-month injury absence. The Dane is a former Workington rider who can usually be relied upon to pile up the points at the Cumbrian track, but he was plagued by mechanical problems on a night to forget. Panthers remain a point clear at the top of the SGB Championship on 41 points, but are merely one of three teams who could still finish in pole position as a fascinating conclusion to the regular season continues. Third-placed Workington are now onto 39 points and still have a trip to Newcastle tomorrow (September 16) to come. The Comets have failed to fit in their other meeting against Lakeside ahead of the cut-off date to count towards play-off standings. The Hammers themselves are down in fifth on 35, but only points difference keeps them out of the top four. They could even move level with Panthers if beating both the city side and Newcastle tonight (September 15) in a double-header at their new Rye House base. Panthers are involved in the second part of that fixture and are due to be on track around 8.30pm. Second-placed Glasgow can’t improve on their current 40-point tally after losing 50-40 in Lakeside’s final meeting at their Arena Essex Raceway home last night. Fourth-placed Edinburgh are likely to miss out on the play-offs after losing 48-42 at home to Berwick when completing their season last night. Berwick themselves are sixth but could still qualify if they win at Ipswich tonight and Lakeside fluff their lines. But Johnson is only concerned about how Panthers perform. He added: “Rye House is a track where we’ve had success in the past and it’s one that several of our riders really like. Panthers again use Barker as a guest but their plans to call on Stewart again have been wrapped due to his crash last night. Glasgow man James Sarjeant not steps into a makeshift reserve combination with Newcastle man Carl Wilkinson replacing skipper Lambert who gets married today. WORKINGTON: Rene Bach 17, Rasmus Jensen 12, Mason Campton 10+2, Tero Aarnio (guest) 6+1, Nicolai Klindt 6+1, Kyle Bickley 1+1, Rider replacement for Ty Proctor. PANTHERS: Ben Barker (guest) 10+2, Bradley Wilson-Dean 7, Jordan Stewart (guest) 7, Michael Palm Toft 5+2, Coty Garcia (guest) 5+1, Emil Grondal 4, Ulrich Ostergaard 0.